Look at the accompanying photograph of one of the two castaway stars talked about in this article (it's at the tip of the little white arrow). All I see are a lot of little white dots, and I can only imagine the skill and talent of those brilliant scientists who, first, devised the theories that predict such events, and second, devised the equipment that can actually find these tiny dots -- in reality giant balls of fire -- and then photograph them. How lucky we are that such bright and dedicated people exist! Cambridge, MA - TV reality show contestants aren't the only ones under threat of exile. Astronomers using the MMT Observatory in Arizona have discovered two stars exiled from the Milky Way galaxy. Those stars are racing out of the Galaxy at speeds of more than 1 million miles per hour - so fast that they will never return. 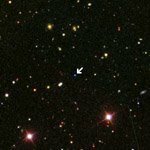 This research has been submitted to The Astrophysical Journal Letters for publication and is available online at http://arxiv.org/abs/astro-ph/0601580. Authors on the paper are Brown, Geller, Scott Kenyon and Michael Kurtz (Smithsonian Astrophysical Observatory).